Who wants to give a boring gift? Not me. That's why I like to give a juicer gift. I love to give gifts, and finding unique and specialty things are really what I like to focus on. I feel that a juicer fits into that category. It’s something someone might not have the money to buy themselves, but something they would adore if they had. Juicers make great presents for any gift giving occasion. I personally think a juicer gift are good for both people who are health conscious, and people who are not- for several reasons. While juicing for health and good nutrition are first on my list for wanting fresh juice, I meet many people that really just like to juice because it simply tastes better. Some people just want to look better or lose weight. And then there are people that just like juicers because it enhances their parties (for party punch, and holiday breakfasts). Juicing is something that even non-cooks will do and enjoy. So if you are debating on giving a juicer as a gift, don’t, most people would really appreciate a juicing machine. It’s one of those things that they might not buy for themselves, but absolutely would LOVE to get as a gift. 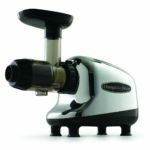 As far as kitchen appliances go, a juicer is pretty affordable for something more specialty, but for the gift receiver, a juicer gift is pretty substantial and thoughtful. The prices are equal to that of a coffee maker. They have cheap ones, good ones and really really good ones. Here are some occasions to consider a juicer gift! Birthdays: A birthday is a time where you have so many gift options. But for someone who has it all, a juicer can provide years of use and good nutrition. Holidays: (Like Christmas or Valentine’s): Awesome choice, especially if the receiver has a family. Substantial gift and makes a good surprise. Anniversaries: Good gift to give a spouse, especially ones the like the kitchen. And husbands out there- pretty thoughtful too. Weddings & Bridal Showers: Most ladies would probably agree that starting your marriage off with a juicer would be super! If it’s a younger women, they probably don’t have their own juicer yet. Baby Showers: This is actually something people don’t think about. A juicer is good for mama and baby to come. Juicing for pre and post pregnancy provides good nutrition during pregnancy and aids in weight loss for post-delivery. Wrapping All juicers come in a wrap-able box. Most juicer boxes are heavy and large, but it’s manageable to wrap, or put in large gift bag. I like the jumbo plastic gift bags you can get at target or walmart. They are easy and cute! Consider including a juicing book with your gift I find that it’s nice to pair a juicer with a good juicing book for a complete gift. It allow the gift reciever to start using the juicer by giving them options. I have several that I think are the best juicing books, but I list the ones below that would probably make the best gifting book. This juicer is extremely fast juicing. Whats cool is that it has a variable speed that can be adjusted based on what you're juicing. It's not bad looking either, and more compact then some of the longer styled single gear juicers. 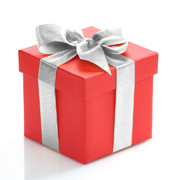 It's great for a gift because it's features make it easy-to-please, but its not complicated or high tech. This would be a winner for most people, especially those who want to get into juicing but just haven't yet. This Omega model has proven durable and popular for many years. Its versatile, single gear technology provides good nutrition. You can make nut butters, ice creams, baby food and can juice various types of produce. It comes in a few “looks” but I think the silver and black model is the most stylish. The Vitamix. While the Vitamix is not a juicer, it can juice. A juicer extracts the juice from the fruit, the Vitamix blends the whole fruit to make a juice. The reason I’m mentioning it as a gift is because it is probably the best gift you could ever give someone who likes to cook and cares about nutrition. It is a super high speed, high power blender. It completely replaces several types of kitchen appliances (like a food processor, café grinder to name a few) and is easy to clean. While is a great gift for any cook, It’s the ultimate gift for a bride-to-be or mommy-to-be party! I have never met someone who has not liked their Vitamix. Here are some juicing books that are a great single gift, or for pairing with a juicer gift. I’ve picked these for the reasons I explain below, but if you want to see a list of all good juicing books, go to the best juicing books. I like this book because it is good for beginners and seasoned juicers alike. Its simple, straightforward and has loads of recipes to choose from. I also think it’s a pretty nice looking book, which makes it stand out for a good gift giving option. It’s one of those books you can leave out on the kitchen counter as a decoration, very cute. Makes a great item to pair with a juicer gift. This is a great book if you are giving it to a more health conscious juicer. It lists juices for ailments and nutritional information. It’s a good go-to book, and I have experimented with many recipes from this book with great success.